Written by Nicole Kohler on June 23, 2016 Blog, Subscription sites. If your business is based on the subscription model, or you offer subscriptions on your store, this is a reality you already know: the path to acquiring a subscriber is a long and tedious one. Shoppers can take a long time to make up their minds about spending money, but that goes double for an investment over many weeks or months. The task of convincing someone that they need your product or service on a recurring basis isn’t easy, either — even if it’s something they really enjoy, like chocolate or coffee. So what’s a subscriptions site to do if they want to shorten this path to acquisition? For starters: take a long, hard look at your store’s homepage and the role it’s playing in convincing potential subscribers to sign up. Your homepage is the first thing most potential customers see, after all. And if it’s not making a compelling enough argument about the benefits of your products, a subscription model, or your company, you can kiss the promise of recurring revenue goodbye. Let’s explore some of the best practices you should follow for customizing the homepage of a subscription site, and discuss how they can ultimately help you secure more subscribers. Before you can convince a shopper to opt in to a subscription, you have to convince them to opt in to your products. After all, products are the core of your subscription plans — if you can’t show potential customers why they’re worth a shot, you won’t be able to get very far with your subscriptions, either. Convincing customers to subscribe starts with convincing them your products are worth a buy. Get a peek into past boxes before signing up — and know exactly what’s in store for you. Good form, Kawaii Box. If you lead with the value of your products, it will make it easier to convince a shopper that there’s value in a subscription as well. But that’s another task altogether. Depending on what you offer, it might not be too difficult to convince a shopper to buy your product once. Buying your product over and over, though? That’s a harder sell. Your homepage is an ideal spot to make the benefits of buying on subscription clear. Whether those benefits are cost savings, convenience, or access to something exclusive, you should aim to let visitors know why a subscription is worth it — and do so right away. Ice cream in the mail? It’s real. And it’s magical. The appeal of an ice cream subscription is likely obvious, but Salt & Straw clearly explains why their ice cream subscription is the one worth buying: with their Pints Club, you get five new flavors to try each month. It’s a crystal clear sales pitch that sets them apart. Note also that Salt & Straw uses a combination of images and text to make their point clear. You’ll see the same theme repeated with many of the other sites highlighted here. You can say whatever you like about your products or the benefits of a subscription model, but great photos are ultimately one of the best ways to drive your point home. Pricing is a common element to find on the homepages of traditional eCommerce stores — it’s coupled with the products themselves. Yet if you head over to many booking, subscription, or membership sites, you might find yourself digging for those numbers. A word of caution: your potential customers don’t like digging for information, especially pricing. In fact, if some shoppers can’t find how much a product — or subscription — costs right away, they’ll get frustrated and abandon your site. The solution? Add the prices for your subscriptions somewhere on your homepage, even briefly. “Starting from $19.99 per month,” will work, as will “plans available for $5, $10, and $20 weekly.” You can then add a link to a page with a full pricing plan. Henry J Socks makes the matter of finding prices for their socks and boxer subscriptions easy: scroll down the homepage and they’re right there, with easy links to access full details for each. Pricing for both options is visible in the copy, and the buttons lead interested shoppers to full details. Transparent pricing based on what you want and how often you need it. Right up front. We love it. This transparency goes a long way to keeping potential customers satisfied… and on your site. Pricing is one of the details that’s most commonly hidden on homepages, no matter what is offered by the store, but it’s not the only one. You might unintentionally be losing potential customers by not mentioning the frequency with which you can send your products. Many shoppers assume that subscriptions are a monthly deal only (it’s become the default), and if they don’t see you specify something different, they might say “I can’t afford this!” and jump ship. But if you have bimonthly delivery options, twice a year subscriptions, or even more frequent delivery plans, you should mention those right up front. Your options are made clear right up front. Plus you can see how much you’ll pay (and that it’s free shipping!). Thumbs up. The copy above each option is a nice touch as well, suggesting which delivery frequency might suit you best depending on the amount of space in your fridge or freezer. We give that a hearty thumbs up. Our final bit of advice goes out to those of you creating a store with both stocked and subscription products, or considering adding subscriptions to an existing store to boost your revenue. First things first: give your subscriptions enough real estate on your homepage to be noticed. Even if the majority of your revenue doesn’t (yet!) come from subscribers, you won’t do yourself any good to hide the option away. Secondly, if your store’s been around for a while and subscriptions are a new option, add graphics, banners, or some more beautiful photos to your homepage letting existing customers know they can now get your products automatically. Again, if you hide the option away, they won’t know about it — and you won’t make any money. 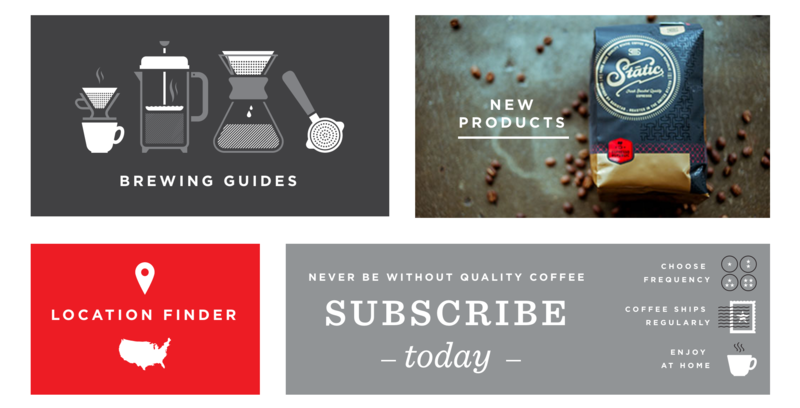 Wonderful coffee, and a subscription option made available for those of you who might like it. Another coffee store, Nobletree Coffee, does the same from the very start, placing convenient links to both their shop and their subscription options at the top of their site — so whether you’re new to their coffee or a longtime drinker, you know the option’s available. Coffee two ways — it’s yours at Nobletree. The journey from visitor to longtime customer starts at your homepage, and that’s why it’s crucial to make this first experience count. If you can’t impress them visually, it may create doubt that you can impress them with your deliveries, too. We hope this advice for improving the first page of your subscription site has proven helpful. If you have any questions, comments, or tips for us, feel free to leave them in the comments! Totally agree with you that acquiring a subscriber is truly long and monotonous way; I have found some best information through this post and it looks perfect to customize subscription. And one thing more which one I like a lot and that is “Showing off products”; it’s really amazing way to convince shopper. Thanks for providing useful information through this blog. You are really awesome. Currently, I am planning on working a model just as you have mentioned in the article. I will surely try to incorporate it into the same. After all, the number of subscriptions made Microsoft’s Bill Gates to acquire hotmail.com at a way lower price whereas made the current CEO of Microsoft, Satya Nadella acquire LinkedIn by paying a premium of 50% of the current deteriorated share price of LinkedIn. Subscriptions play a vital role for any business. Thank you for the presenting the Big Picture on subscriptions. I am currently in the process of redesigning my site from a one page “above the line” to longer more easy to read pages. You are most welcome David 🙂 We’d love to see your site when it’s finished! Fantastic post, very much useful information for customizing woocommerce home page, we are web development company and your all articles are very helpful for us when you got any trouble regarding woocommerce then we evey time we found solution here.